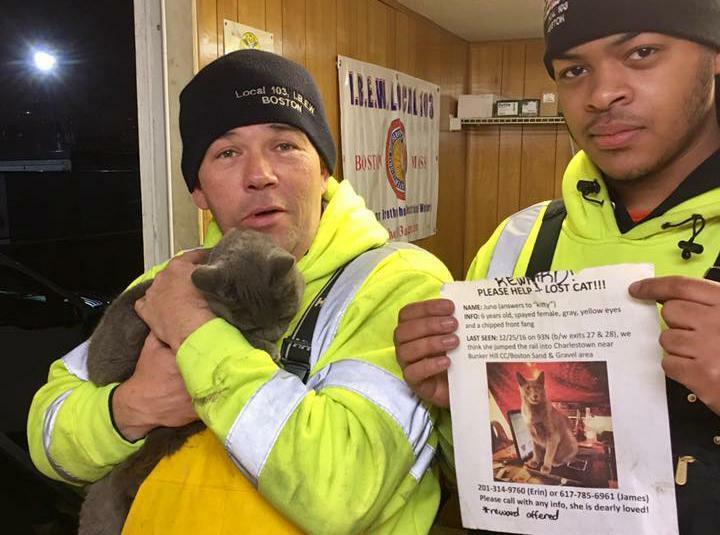 Electricians from Local 103 posed with Juno after finding the cat along a steel girder on I-93 this week. It all happened so fast. James Norton just couldn’t grab her in time. On Christmas Day, as Norton traveled toward New Hampshire on Interstate 93 North, his van door began to rattle and jangle, an annoying defect of the weathered vehicle. As he had done many times before, Norton grabbed the handle, pushed the driver’s side door open, and then began to pull it shut again. In that split second, something furry tumbled out of the vehicle, which was traveling in the fast lane. Norton’s cat, Juno, had apparently hunkered down in the footwell of the large van unbeknownst to her owner, after escaping from her travel crate. 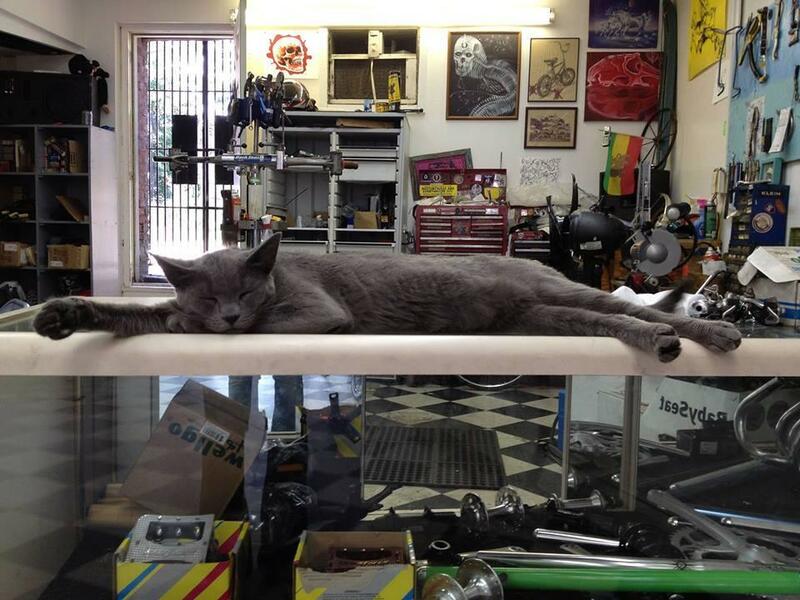 Just like that, the silver-colored feline disappeared onto the busy highway. But on Wednesday, after more than a week of endless searching that forced the Boston couple to postpone a winter trip to Mexico, and after they hired a tracking dog and peppered parts of the city with colorful “Missing” posters, McCutcheon and Norton received a promising phone call from crews doing maintenance work under I-93, near where Juno had slipped out. They had found the cat — and she was alive. The 6-year-old pet was discovered crouched and hiding 80 feet in the air, on a steel girder that runs under the highway in Charlestown. McCutcheon said although many people might have abandoned hope after their cat fell from a moving vehicle onto one of the state’s busiest highways, she and Norton never lost faith in finding Juno. From the very start, she said, Norton spent 12 hours on Christmas Day scouring an area beneath the highway near Boston Sand and Gravel, where he believed Juno may have run to following the unexpected fall. The loss of the cat put a damper on the holidays. McCutcheon, a graduate student and visiting lecturer at Tufts University, and Norton, who owns a bike shop in Jamaica Plain, poured resources into their search efforts. They hired Jamie Genereux, a Rhode Island-based pet tracker, to come out to Boston with a search dog to sniff out Juno, she said. Genereux had wanted to send a drone up to check the girder where Juno was eventually found, but couldn’t because of strict regulations on the unmanned aerial vehicles. Hiring the animal tracker cost McCutcheon $350, a fee that she said was funded in part by generous donors through a GoFundMe.com page that she had set up. McCutcheon also enlisted help from several neighborhood Facebook groups and two pet-finding organizations — Charles River Alleycats, and Missing Dogs Mass. The latter group lent the couple a special trail camera that snaps photos when it detects movement. McCutcheon and her boyfriend sneakily set up the camera near Boston Sand and Gravel, and placed food nearby. But it wasn’t enough to coax Juno out of hiding. And in a last-ditch effort, the couple even took an old sheet that had their scent on it, and cut it up into little pieces. They then rode their bicycles from I-93 to Jamaica Plain, placing the squares along the way like Hansel and Gretel leaving a breadcrumb trail, hoping that Juno, a cat with smarts, would pick up the smell and follow it home. “I just kept feeling like if she is out there right now, I need to do everything I can to help find her and get her home,” said McCutcheon. But it was electricians from Local 103 who ultimately found Juno while working late Tuesday night into Wednesday morning. The crew was on I-93 South doing maintenance work along a steel girder that sits directly beneath the northbound highway, where Juno had tumbled out. Jay Dondero, one of the workers, said an employee came down off of a lift, and said, “I don’t know who was more scared up there, me or the cat.” The comment threw Dondero for a loop. Dondero called down to a worker sitting in his truck below the highway, and alerted him about the cat. That worker, serendipitously, was right next to one of the “Missing” posters McCutcheon and Norton had hung up earlier in the week. The workers from Local 103 quickly realized it was Juno. At first, they couldn’t get the cat to come down. But after buying some cat food from a nearby gas station, they managed to convince the animal that they were trying to help. “One of the guys got her to start eating some of the food out of his hand, and when he got her comfortable enough, he grabbed Juno and brought her down to the trailer,” said Dondero. The workers called the two numbers on the flier, left messages, and then eventually connected with McCutcheon the next morning. “She was very happy,” Dondero said. Images posted to Facebook by McCutcheon and Dondero show the crew holding both the gray cat and one of the posters that helped them connect the dots the day of their chance discovery along the girder. The post has been shared more than 100 times, and has been flooded with positive comments from people calling the workers heroes. McCutcheon, who is now in Mexico enjoying her vacation, said if Local 103 workers hadn’t been there, it’s likely no one would have ever found Juno. “They were so humble and nice, and they want to meet us, and I am going to meet up with them when we get back in town,” she said, adding that she still hadn’t seen Juno, who is now home safe and being taken care of by friends. McCutcheon encouraged other people with missing pets to keep searching, because they might find a missing pet in the most unlikely of places. Juno taking a cat nap.